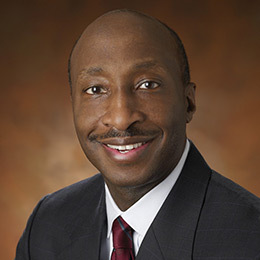 Kenneth C. Frazier is chairman of the board and chief executive officer of Merck & Co., Inc. Previously, Ken served as president of Merck with responsibility for the company’s three major divisions: Global Human Health, Merck’s sales and marketing division for pharmaceutical and vaccine products; Merck Manufacturing Division, Merck’s manufacturing and supply division; and Merck Research Laboratories, Merck’s research organization. Ken has held a broad range of senior management positions since joining Merck in 1992 as vice president, general counsel and secretary of the Astra Merck Group. He was elected vice president of Public Affairs in 1994, and, in 1997, assumed the additional responsibilities of assistant general counsel, corporate staff. Ken was promoted to vice president and deputy general counsel in January 1999. In December 1999, he became senior vice president and general counsel. In this role, he oversaw Merck’s legal and public affairs functions and the Merck Foundation. In November 2006, he was promoted to executive vice president and general counsel. Ken served as executive vice president and president, Global Human Health, from 2007 to May 2010, when he became Merck president. Ken became CEO and member of the board of directors January 1, 2011, and became chairman of the board on December 1, 2011. Prior to joining Merck, Ken was a partner with the Philadelphia law firm of Drinker Biddle & Reath. Ken sits on the boards of PhRMA, Weill Cornell Medicine, Exxon Mobil Corporation and Cornerstone Christian Academy in Philadelphia, PA. He also is a member of the American Academy of Arts and Sciences, the President’s Export Council, The Business Council, the Council of the American Law Institute and the American Bar Association. Ken received his bachelor’s degree from The Pennsylvania State University and holds a J.D. from Harvard Law School. Today’s Merck is a global health care leader working to help the world be well. Merck is known as MSD outside the United States and Canada. Through our prescription medicines, vaccines, biologic therapies and animal health products, we work with customers and operate in more than 140 countries to deliver innovative health solutions. We also demonstrate our commitment to increasing access to health care through far-reaching policies, programs and partnerships. For more information, visit merck.com and connect with us on Twitter, Facebook, YouTube and LinkedIn.